For the second year, we are hosting a TEDxGreenville Open Mic at the September Salon. 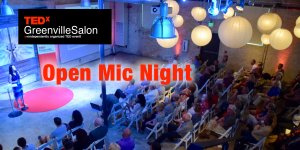 The TEDxGreenvilleSalon event gives some potential speakers the opportunity to secure a spot at the main TEDxGreenville conference in April 2018. Here is how it works. About a dozen people have been selected to present their idea worth spreading with a 3-minute talk. Each talk will be put on the clock and the microphone will be turned off three minutes after the beginning of the talk. The audience will secretly vote on their favorite talk, and the top speakers will get higher consideration for speaking at the April Main Event.